I am developing brand guidelines for a particular sub-brand where I work. Certain details are specified with a rich black, which is a CMYK mix of C10, M10, Y10, K100. Mostly process printing will work but if I have to spec a PMS-Coated color, what would be closest to 10-10-10-100? Something to contemplate over. 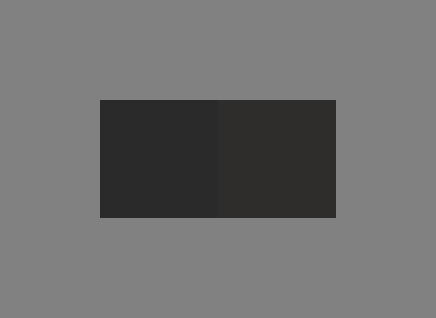 In the image below you can see 3 colors 2 dark ones and a lighter gray to make it easier eye adapt to the color and not shine the white background so much. Is there a difference between the colors? Would it be acceptable to get some prints in one color and one prints in the other. if you answered yes, then congratulations either you have a passable color vision or your monitor collaboration is out of whack (note the fact you can see difference does not mean it can not be out of whack anyway). If you think the difference is meaningful, then we have a problem. You see these are both simulations of the mix C10, M10, Y10, K100 in two different print standards. The one on left is Coated FOGRA39 And the one on right is Coated GRACoL 2006. Since they are meaningful as per your opinion then you should consider using a different PMS color for each. To solve this ask whoever deals with your printer what profile you and they were using, they will know. Hopefully next time you will also. If on the other hand you think the difference is meaningless. Then all is good choose one suitably dark color and go with that. Why stress about color anyway since your results have quite big variation anyway. If not acceptable then you need to know the color profile. If acceptable then its does not seem so important to say that the color is C10, M10, Y10, K100 but something around those values. Now once you know what profile you have then you can ask Photoshop or some other color match library to give you a close match and start searching with that. Then print a piece in the color and by eye look up in your PMS swatch sheet and choose one. It is also possible that you want the PMS color to be different because you can. You do not start with a relative value to find an "absolute" one. The rich black "mix of C10, M10, Y10, K100" is only the mix you wanted to "specify". And it is not specific at all. To define a CMYK value you need to define the proper color profiles, mainly the RGB space and the CMYK profile. Once you define that you could just use the color picker and let find your application find the nearest Pantone color. But there are some other issues here. The nearest Pantone color could be not what you "expect". I am guessing you want a neutral black because you defined equal amounts of CMY inks... but that is not neutral. A neutral color, depending on the specification could need more amount of Cyan to balance the red tint produced by the two additional inks, Magenta and yellow. For example, the SWOP 2 defines the CMYK deepest RGB black when converted, as c75 m68 y67 k90. You can see the cyan has a bigger value. Your current value has, therefore, a warmer look, so the tool could look for a warm black. Define a Pantone first, and then translate to CMYK using the proper profile. Not the answer you're looking for? Browse other questions tagged color-conversion pantone color-reproduction black or ask your own question.